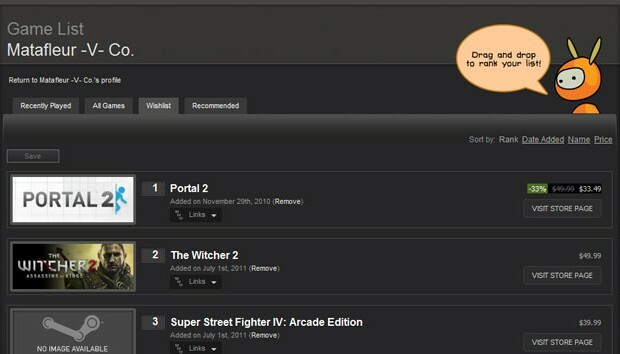 Valve’s online game store, Steam, has been a boon for many gamers. Buying games without having to step out of your home? Nice. Buying games at cheaper prices than retail? Even better. But where Steam really takes the cake is its bi-annual holiday sales, where many games — even recently released triple-A titles from big publishers — go on massive discount. While many games are already at bargain prices at a Steam sales, did you know that you can save even more by shopping smarter? 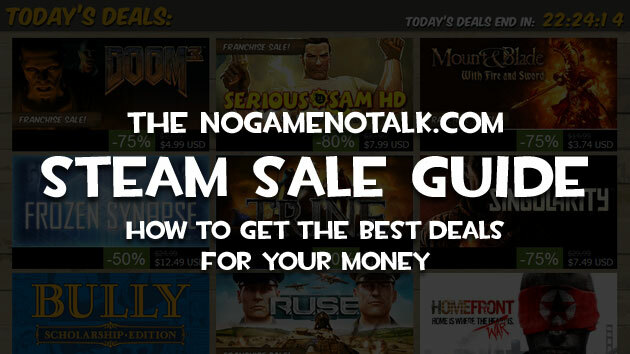 Read on to find out how to get the best bang for your buck during any Steam sale. The Steam Store has two major holiday sales a year: the summer sale generally begins near the start of July, while the winter/holiday sale begins in the later part of December, near Christmas. Like any other activity in life, doing some preparation and research before each sale begins will go a long way towards helping you to spend your hard-earned money wisely. The first thing to do, of course, is to determine which games you want to buy in the first place. Ask a friend, read some reviews, watch some “Let’s Play” videos on YouTube; do anything you must to help you decide if a game is worthy of being played by you. My wishlist. I know! I don't have Portal 2 yet. Don't laugh at me! Once you’ve determined which games you want, add them to your Steam Wishlist. The wishlist gives you all the prices of the games you want at a glance; if any are on sale, it’s easy to tell. To add a game to your wishlist, simply go to the game’s page in the Steam store and click on “Add to Your Wishlist”. To view your wishlist, click on the link at the top right of any Steam Store page. Now that you know which games you want to buy, the next step is to determine how much you are willing to pay for them. 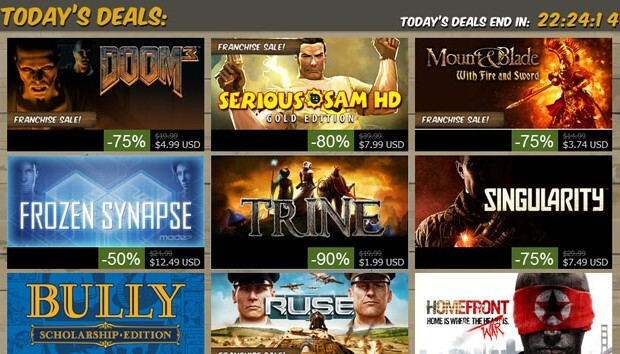 During any Steam sale, games go on sale anywhere between a modest 20% discount to a steep 90% cut. How low the price goes before you’re willing to fork out some cash is entirely up to you. Think about how much game time and enjoyment you think you’ll get out of the game, then think about your own finances. I’m sure you can sort this one out for yourself based on your own comfort level. The key to getting the best possible value for your money is to be patient. While waiting for the Steam sale to begin is in itself an exercise in patience, once the sale begins it might be worth your while not to go on an immediate spending spree. Steam sale daily deals... Wallet health critical! It might be tempting to get that game with a 20% discount now, but during Steam sales there are usually daily deals which offer a further discount off the usual sale price which can come up to a total discount of 50% or more. Waiting a mere few days to save 50% instead of 20%? A no-brainer in my books, that’s for sure. What if the game you want is never featured as a daily deal? Well, get it on the last day of the Steam sale. No loss to you. As a bonus, you’ll never be hit by buyer’s remorse when you see the game you just bought being further discounted. The daily deals are exactly that: they only last for 24 hours. Once the deal is gone, it’s gone for good. This is why making a list of games you want, together with the price you’re willing to pay for them, is so important. Knowing what you want and exactly how you want it way beforehand helps you make quick decisions on whether to buy — or not to buy — those games on discount. Many games that are sold through the Steam Store have special multiplayer packs available for purchase. These packs bundle multiple copies of the game together for a discount. The usual deal is commonly known as the “four-pack”, where you get to buy four copies of a game for the price of three: a 25% discount off the total purchase. These packs are available even when there’s no Steam sale. During a Steam holiday sale period, however, these bundles go on further discount as long as the game itself is on sale. If you can find or convince another friend or three to buy the game, you stand to save big. 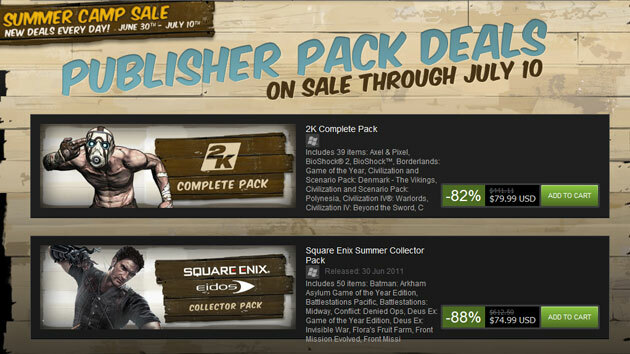 Steam publisher pack deals... Mmmm. 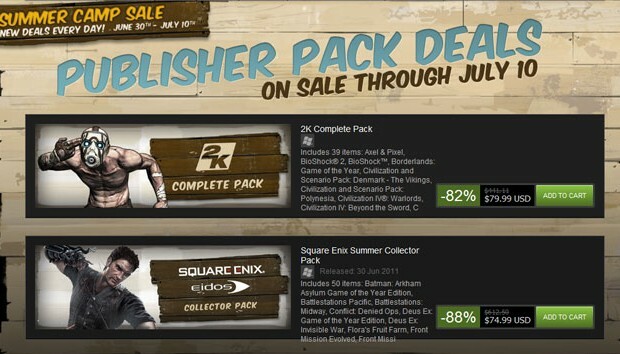 During Steam sales, big publishers also offer game packs which can include their entire catalogue of games for a big discount. While it is a relatively large amount of money to put down at one go, you usually get many games, including some A-listers, at a bargain price. More often than not, I’m guilty of this. Very guilty. No point ending up with 20 games at a heavily discounted price when you don’t even have the time to play them. Buy smart, make sure you’ll be playing those games eventually, or it’d just be wasted money. Happy shopping, and happy gaming! Got any tips of your own? Share them in the comments below! That basically sums the steam summer sale up. Also a FYI, you can buy games with your steam wallet, so if you have remaining cash after buying items in Team Fortress 2 or Portal 2, you can use it to purchase game for yourself or gifting it. What if a game is currently discounted for a daily deal but you still want to wait for it to be discounted further? If the game doesn’t show up again as a daily deal, does that mean you just lost the window of opportunity to buy the game at a discounted price? 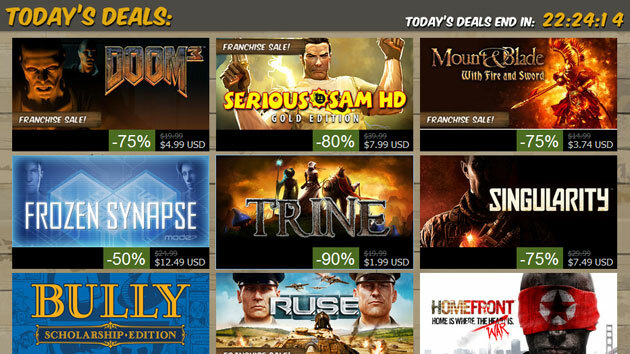 From experience, daily deals are the furthest discount you’ll get on a game for that particular sale period. So yes, once the daily deal is over, you’ve just lost the opportunity to buy the game at that particular low discounted price.